Much praises are going out the Guyana Police Force for their ongoing operation against the touts at various bus parks. Whilst there’s a scarcity of jobs, it should be noted that touts are consider good to some and bad to others. They are humans and help lots of people in some sort of way whilst they are touting but over the years, lapse within the system cause them to stray away from their illegal duties and are now consider menace. Apart from that, rouge elements infiltrate their groups and stir up misery for them and some naturally cause them to stray away from duties thus they are being deem menace and everyone gets the blame. I hope that they would not be penalized harshly because they were working for an honest dollar but because some of their attitudes and pressure from others, the complaints keeps increasing on them. If there is another legal way for them to earn a living, I hope that they are assisted but the way things are in Guyana, they will definitely be back to that job. The Guyana Police Force have to explore method to eradicate that seemingly lawlessness and one of the main reason touts exists is that there’s many buses that does not want to join the line, instead they choose to load in front of others immediately upon arrival at the various parks. They should definitely find a method to stop that but there might be hurdles to cross before they could arrest that situation properly. Mainly, there’s members of the Guyana Police Force that owns minibuses, have relatives or friends who owns minibuses and when appropriate actions are being taken against them, just one phone call and to the dismay of other minibus operators, they are free to continue with their lawlessness. Added to that, there’s many Policemen that drives minibus when they are not on duty and when stop, they are allowed to continue once they are recognize, if not, a flash of their ID Card and they are free to go along lawlessly. There are stipulated parks for minibuses, but some rogue operators park at various places ahead of the bus parks and load with the assistance of the touts, and other touts are then employed by the buses in the line to hassle with the other touts and buses. They should address these issues, not go behind the touts alone. Editor, like previous Heads of the Guyana Police Force, I am not surprised to hear our new Commissioner of Police issuing threats towards those who choose to bribe the members of the Guyana Police Force. Echoing words used by his processors does not impress me. I am tired of hearing the same thing over and over. We all knows that there’s charges for those who offer and those who collect bribes. Instead of tooting his horns, he should just address these issues. It’s not nice to go against John Public and you having your members committing the most crime and you not dealing with that. Look after your house first, but then again, he might be wary of that after seeing what happen to the previous Acting Commissioner. 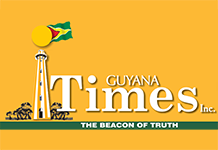 There are instances where the person is being hold without any reasonable cause and they are forced by members of the Guyana Police Force to ‘give something’ before they could be allowed to go. Cases exists where they could be charged and release on bail or just allow to go but if you don’t have money to give they, they create excuses and put you into the lockup and in cases, make you call your relatives to bring money to bribe them before you could go. In other words, members of the Guyana Police Force create an environment where you have to pay bribe to members of the Guyana Police Force. Finally, Editor, after reading about one media consultant being robbed and his claims of calling the 911 repeatedly for over one hour and not getting an answer, based on my personal experience using that number, I posted a defense citing my experience and a few others on the social media agrees with me. Over a number of times there’s cases where I had to call the 911 and on the first calling between two to five rings, my calls are always being answered and upon explaining my reason for calling, I am always transfer towards the closest station within the vicinity I am calling from. I must admit and others agrees me, the 911 service is very active and whilst that is worthy of praises, some of the operators are very cooperative, some would exercise some serious attitudes and more than once I had to question them and most cases, when asking their names, the phone would be disconnected. I am presuming that they take their domestic problem to work with them. Added to that, when your calls are transferred, after listing your problem, sometimes you would be fortunate to hear the operator trying to get the patrol unit using the vehicle and in most cases the radio calls would go unanswered and the operator would inform you that they would try to get the mobile patrol and let them visit your area or invite you to the station. If you choose to go to the station, the police would inquire your reason, provide you with few options to choose from and request that you hire a taxi or provide transportation to traverse to and fro. Whilst all of that occurring, there’s the threat of going after vehicle with lights deem as menace to other motorists and the public. I am in agreement with that but I would remind all that to date, majority of members from the Guyana Police Force have the most heavily tinted vehicles and some with the illegal lights but despite calls over the years, no proper action is being taken against them. I should remind the Commissioner that if he wanted to see changes from society, the members of the Guyana Police Force should set an example first. It is unjustifiable to penalized one set for something that is illegal and another set is allowed to abuse it because they are the enforcer. Next articleAre the GRA boss and Police Commissioner asleep?